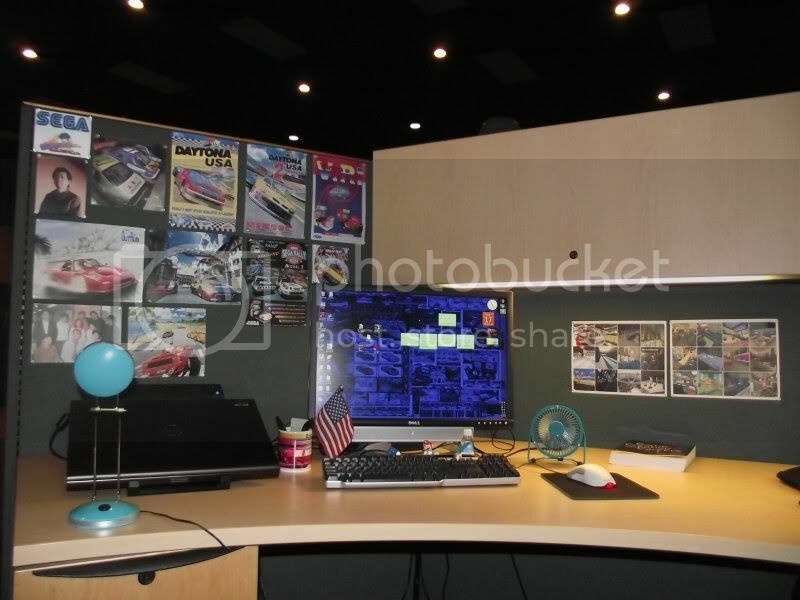 Musings of a Sega Racing Fan: My Desk At Gaming School!! Ok, I want to knock this out now since it's really cool. 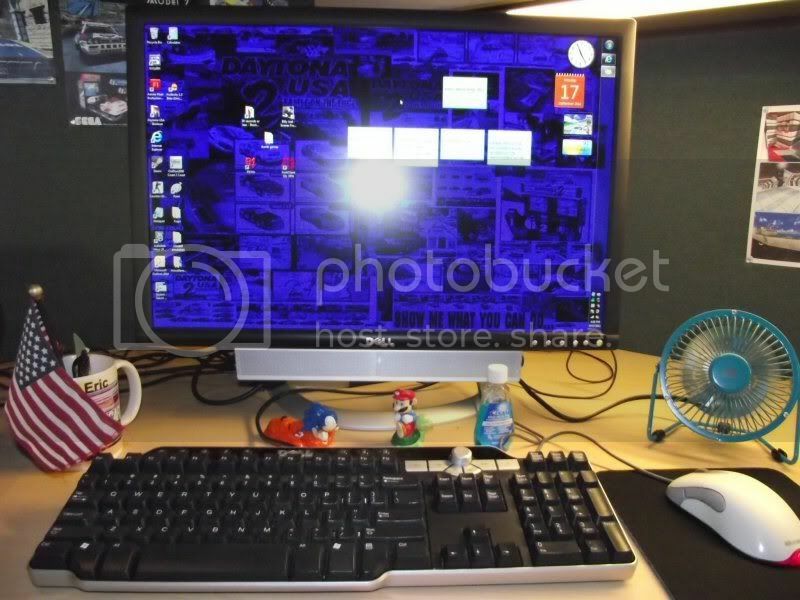 Everyone at FIEA (the gaming school I go to), gets a desk with a laptop docking station. I've already been here a month so I've got mine setup. Mine is out of the way (which I don't mind...I hate being in high-traffic locations anyway) but it looks really cool. 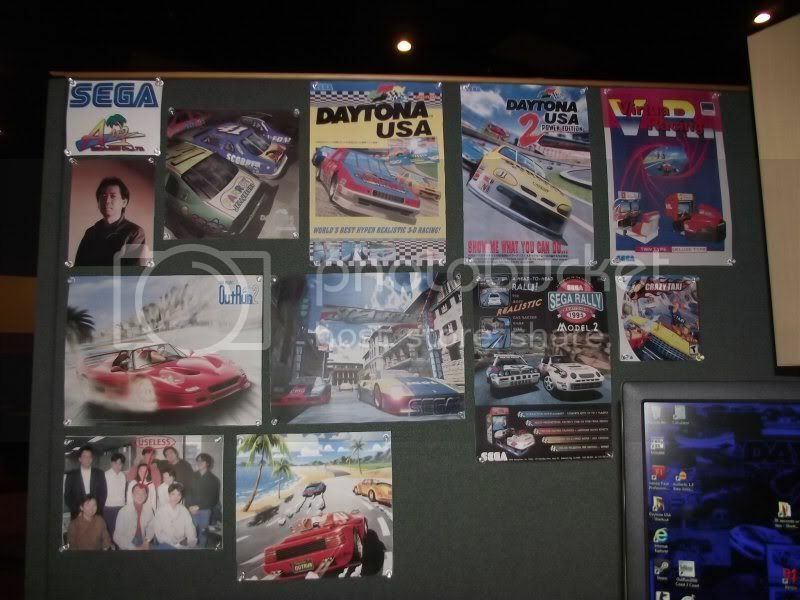 Yes, I actually got my Sega racer pics up! Awesome!!! This is my big wall. As you can see, there's Sega AM2, Daytona USA 1/2, OutRun 1/2, Scud Race, Sega Rally, Crazy Taxi, Virtua Racing, Yu Suzuki, and Toshihiro Nagoshi (calling him useless). A lamp illuminates my glorious shrine, as you can see here. Also, there's my super laptop...a Dell, lol. My computer. 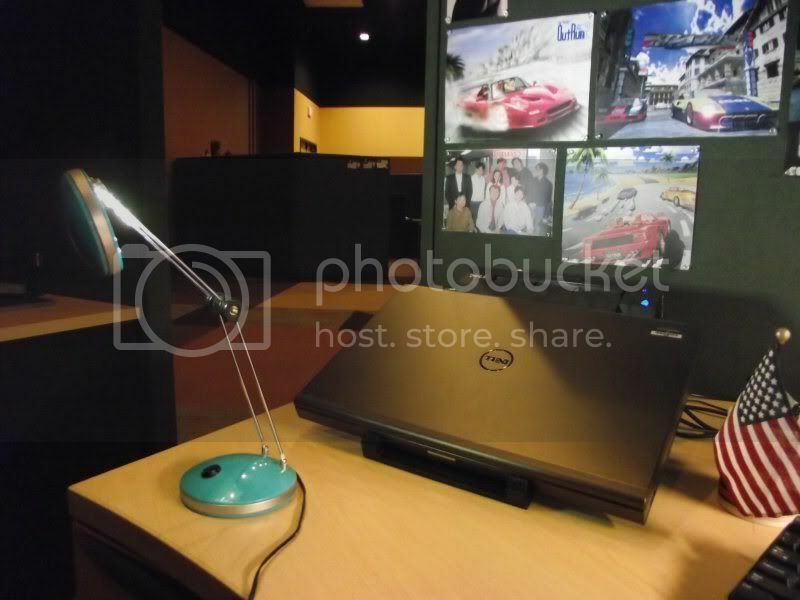 When you plug in the laptop, the screen is tranferred to this monitor/keyboard/mouse combo. And there's Sonic and *GASP* Mario right there. Get this--that Mario figure was on my birthday cake when I turned six (give or take two years). This is also hokey, but I put up some pics of my Counter-Strike maps...I don't care, I like 'em. 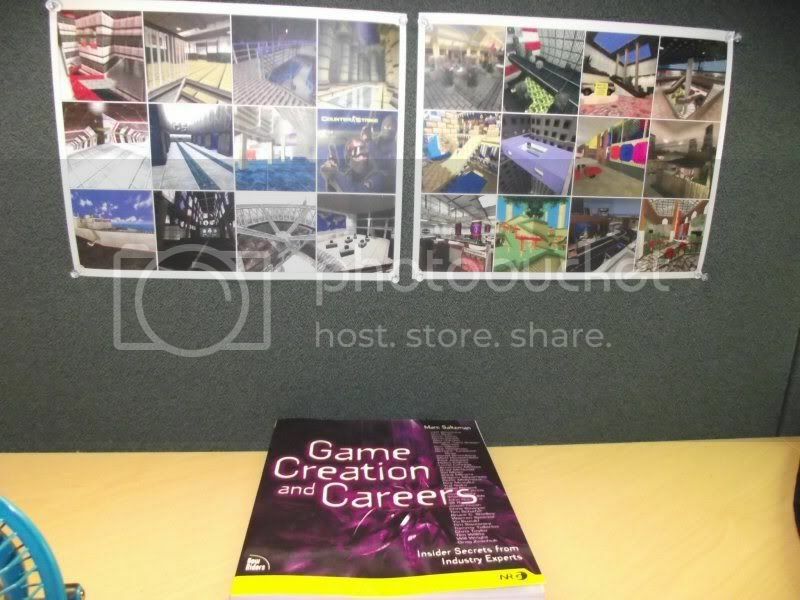 And that Game Creation book...rofl. Now everyone at FIEA got a nameplate complete with some personal info as you can see here. This is what mine says. 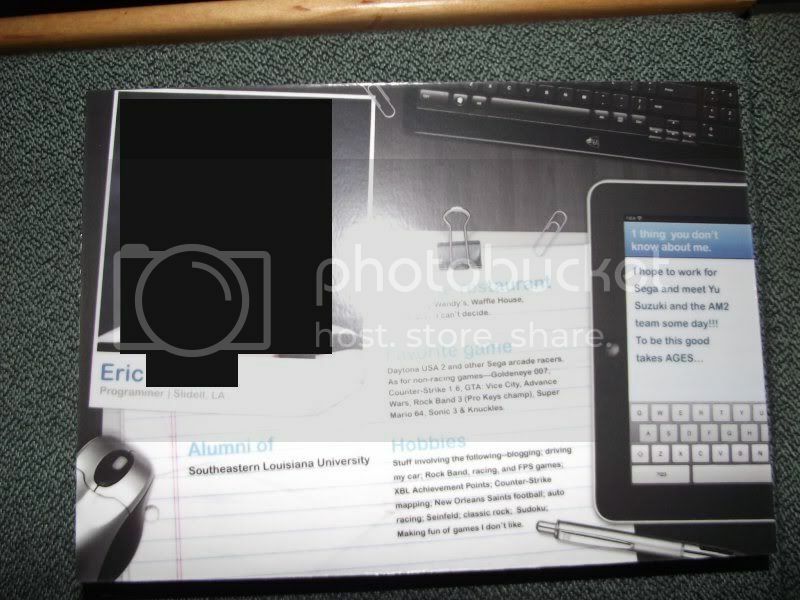 NOTE that I'm not about to reveal my face to the Internet...yet. My Internet career becomes a whole different ball game once everyone knows what you look like. Ok, you wonder how much of an interest I may have stirred by my setup. Well, not much. Some people have assumed I like Sega & racing games, but none have actually referred to any game like Daytona & OutRun specifically. No one noticed Yu Suzuki or Toshihiro Nagoshi either. Also, no one has said anything about the Counter-Strike maps. I'm pimping Sega racers no matter where I go!